Fart jokes, cooties and “one, two, three Jinx you owe me a Coke” are perennial rites of childhood that never fail to make me smile, but some of these new trends leave me feeling a little old and out of it. First it was that array of extra-long shoelaces. Sure the colors were fun-who wouldn’t want to add tropical pink soccer balls and neon green tie dye to their wardrobe-but there was also so much more shoelace to figure out how to tie and then trip over. Seems like a lot more danger than they were worth – which is proof positive that I am old and cranky. Then came the digital pets-Tamagotchi, Furby, Giga. Seriously? There are plenty of real animals waiting to be adopted. Or if you want something low maintenance, get a goldfish. Then came the key chains. You couldn’t walk down an elementary school hallway without hearing the clang of Sponge Bob SquarePants, Strawberry Shortcake, Hannah Montana and Justin Beiber dangling dangerously from backpacks. Surely these were an accident waiting to happen. Squishy mania was next on the scene. An infestation of blob-like sea monsters, jungle creatures and zoo animals began to appear in schoolyards, and fast food restaurants and liquor stores equipped with vending machine capsules were suddenly de rigueur. I was with my niece when she spotted a particularly rare glow-in-the-dark octopus Squishy and I thought I was going to have to call the paramedics to extract her hand from the vending machine. Now silly bandz are the latest, out-of-control kid craze. To a childless person these colorful bracelets stacked like Slinkys up the arms of kids might look like simple rubber bands. Yes, they are rubber bands, but simple, not so much. These silly bands (or bandz depending on which brand you buy) are shaped like everything from Bugs to Barbies and musical instruments to Marilyn Monroe. Even skinny Elvis has his own silly band, which momentarily becomes fat Elvis if you put it around a grownup’s wrist. But the beauty of these silicone-molded bracelets is that they return to their original shapes when you take them off your arm. It’s a magical shape-shifting rubber band. Teachers, at least in some states, are less than thrilled. 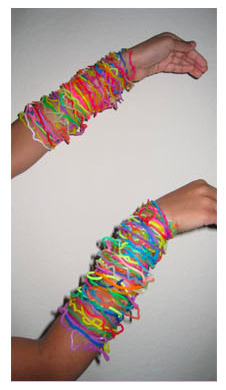 Complaints have come in that silly bands are distracting in class or even downright dangerous. The ban on bands has stretched from schools in Brazil and England to Boston, Wisconsin and Indiana. Can California be far behind? When Leslie’s not pondering the latest kid crazes (Zhu Zhu hamsters, Lady Gaga, My Pillow Pets) she can be reached at Leslie@LeslieDinaberg.com. For more columns visit www.LeslieDinaberg.com. Originally appeared in the Santa Barbara Daily Sound on November 12, 2010.